10/27/17; Lakeland, Fla.; Florida Southern College hosts University in men's & women's swimming. Several UT swimmers gained the title of All-American, meaning the swimmer placed top eight within an event. All-American swimmers who participated in the 200-meter freestyle relay include: senior Katie Bayes, sophomores Molly O’Hara and Megan Waddell, and freshman Hana van Loock. Van Loock and Bayes were also named All-American in the 400-meter freestyle relay, along with freshman Gabbie Gauntt and senior Sophie Long. Katie said out of the four years she has swam for UT, this season’s women’s team has had the fastest swim times. Fellow All-American, Long, said this year held the most national women’s qualifiers out of the three years she has been on the team. “Every practice and minor detail adds up to the overall performance when you race,” Long said. The men and women swim teams placed in the NCAA Division II Swimming and Diving competition in Greensboro, North Carolina. After four days of rounds, the women’s team landed in 12th place with 122 points, and the men’s team earned 24th place with 30 points. “First and foremost, our number one goal is to become an Academic All-American team, then we would like to get as many swimming All-American awards,” said James Kiner, head men’s coach and associate women’s head coach of the team. Kiner has coached UT swimming for 16 years. Both teams have been practicing since Aug. 31, allowing half a year to prepare for the All-American honor and other accolades, according to Kiner. Kiner said the team strengthens their skills both inside and outside of the pool. The swimmers practice 11 times a week, doing double practices on weekdays — both mornings and afternoons — with an additional Saturday practice. Each swimmer is responsible for matching the group’s average GPA without risking being cut from the team. According to junior swimmer Forrest Lundy, the team prepares for important swim events by hosting and participating in the annual Spartan Invite Meet. 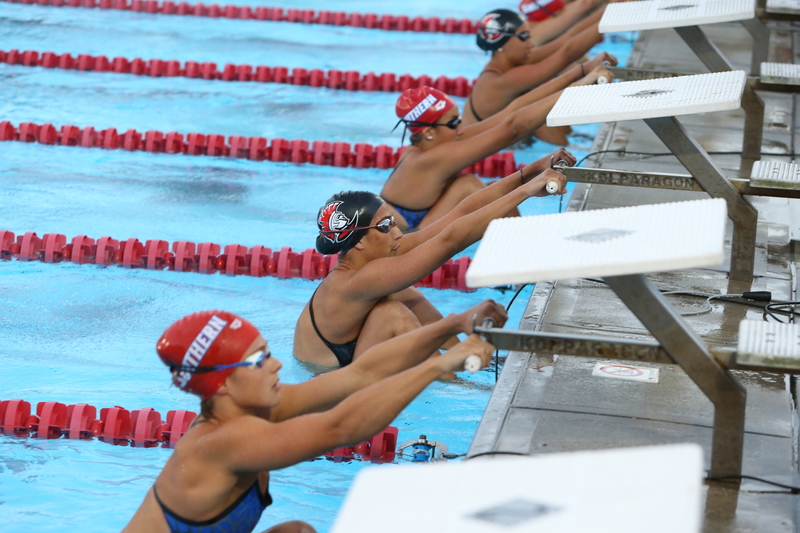 The event includes other collegiate swim teams in Florida, and it allows the team to measure where they stand in regards to competition. “Though I may be biased, I really do see my team as one of the most hard working sports teams at this school,” said women’s captain and senior Brittany Bayes. She said her team has overcome numerous obstacles throughout the year, including commuting to an off-campus pool at 5 a.m. while UT’s Aquatic Center was under construction. “We also lost a couple teammates throughout the season for various reasons,” Brittany said. Lundy added that Hurricane Irma negatively affected the team’s training schedule on top of the other adversities. Katie said non-swimmers may not expect the amount of strain the team endures every season. Katie finds comfort in having her over 45 “family” members on the team to lean back on. Lundy also said the coaches play an “almost parental role” for the team. This year, Brennan is coaching his 39th season at UT. He said alongside swimming, he wants to teach the team to be good citizens of the university and the community. UT’s men’s swim team started in 1976; the women’s began in 1980. Since then, the men’s team has had 138 All-Americans and 35 NCAA appearances with 12 individual championships and 19 top 10 finishes. 107 All-Americans for the women’s team, as well as 33 NCAA appearances — 18 of which concluded in championships and 14 top-tens.